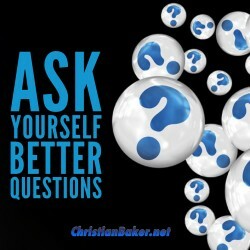 How to ask yourself better questions to change and improve your life? Would you like to improve your self confidence, your focus and ultimately a better life? The questions we ask ourselves impact the quality of our life and our life experiences. We often get stuck asking why questions, why is a powerful word, but it does have the ability to focus attention in the wrong place. It can lead to negative thoughts and destructive thinking. And reinforcing negative habits, beliefs and situations. When you ask why does this happen to me? Or why can’t I…(fill in the blank), them from a mindset perspective your mind will look for reasons to justify this belief. Instead adopt How questions, how can I (fill in the blank)…? How is all about the future. How opens your mind for looking at the possibility of change & how you can make something happen. If you found this video helpful, please please click subscribe, share this video and feel free to leave a commenting letting me know what questions you are going to start asking yourself!